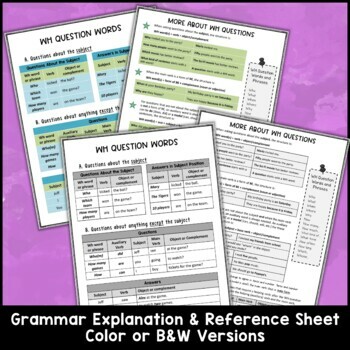 Forming WH questions can often be a challenge, especially for ESL students, and this packet will give them a variety of activities to practice the structure and word order. 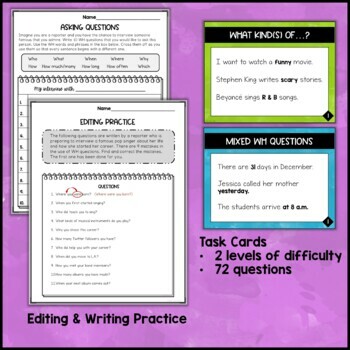 * Two quick reference pages showing the structures used for forming different WH questions with sample sentences. * An editing activity to find and correct errors made in sentence structure. * Scrambled riddles: Students rearrange the words to create a question that will reveal a riddle. Then students work together to try to find the answers. This is a fun activity that has the additional benefit for English language learners to become aware of multiple meaning words (such as key and palm) and other examples of word play. * Task cards. Students practice making questions from statements. 36 sentences with the WH word or phrase given, and 36 that they need to determine the needed word or phrase. There are 72 sentences in all. 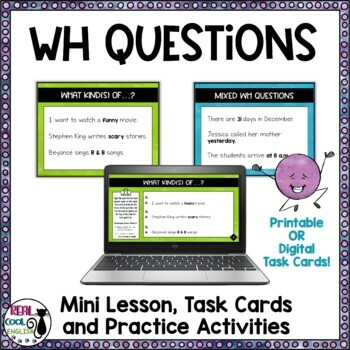 * Update 1/27/19: Now includes WH Question Boom Cards! Students read an answer and then build a question that matches that answer. Drag and drop words in the correct order to make the sentence correct. There are extra available words, so they need to pay attention to tense and number when building the sentence. You can try them out HERE. I ♥ followers! click the FOLLOW MElink to get sale alerts, updates and news about future products.